I found this project by way of a friend. 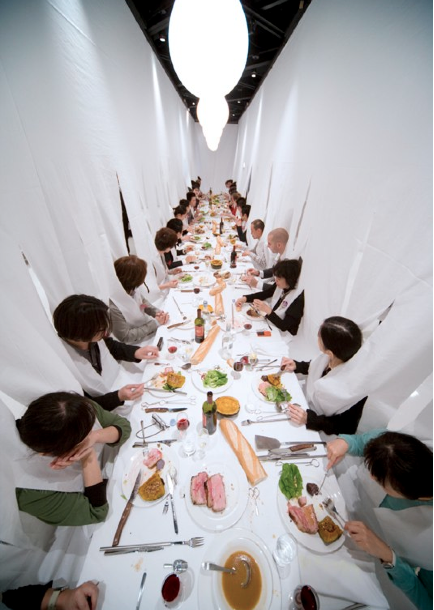 “Sharing Dinner” was done in 2005, by artist Marije Vogelzang. Her idea brought together many people at one large table. It became a complete experience. The artist beautifully describes the concept on her site. What is especially interesting was how the guests were giving different portions of food, so they were intended to share their meal with the person across of them. They were also connected by one giant hanging table cloth, so they were all one, in the experience they had with each other. This is a beautiful and thoughtful project. I would have loved to be a guest.